New research by HPSynC’s Qiaoshi Zeng and scientists from Carnegie, George Mason University, Zhejiang University, and Stanford University, reveals the possibility of creating a metallic glass that is organized on a larger scale. They have discovered glasses that demonstrate order among the nearest neighboring atoms, called short-range order, and a slightly wider range of atoms, called medium-range order. Most research about finding or creating a glass with a long-range, nearly crystalline, level of order - referred to as the perfect glass state - has been conducted on ice and the minerals silica and zeolite. Until now, however, no research into long-range order glass has been successful. Their results have been published in Science. The research team focused on metallic glass made from the elements cerium and aluminum. Metallic glasses are less brittle than ordinary glasses and more resilient than conventional metals. They combine the advantages and avoid many of the problems of normal metals and glasses, two classes of materials with a very wide range of potential applications. 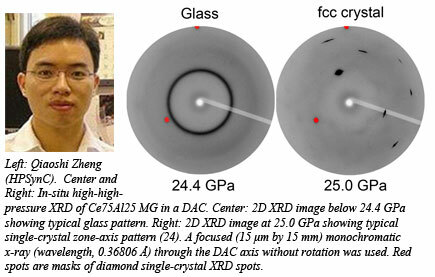 By placing the cerium-aluminum glass under 25 GPa of pressure, the researchers were able to create a single crystal. When the glass was brought back to ambient pressure, the new structural order was preserved. Using x-ray techniques and simulations, they determined that the atomic structures of cerium and aluminum prevent the glass from assuming the highly ordered state at normal pressures. Under the intense 25 GPa, however, an electron in cerium shifts, allowing the crystalline structure to be created [Q. Zeng et al., Science 332, 1404-1406 (2011)].